Katsumata went to study industrial design in France, where she met a female ceramic artist who used hand-bilt forms to express herself in a free and spontaneous manner. The freshness of this artist’s work made such an impression on Katsumata that she began making pottery herself. It was also through her French art-school tutor that she discovered the beauty of Japanese ceramics. 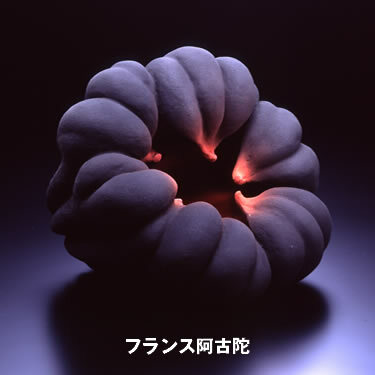 On her return to Japan Katsumata sought to create ceramic vessels in tune with Japanese lifestyles and to carve out her own personal style, and it was from this work on containers that the pumpkin series emerged. Katsumata’s fondness for layering colored slips owes much to a technique of overlaying colors in oil-painting, which she had previously studied. Another fascinating aspect of her work is the variety of textures which extend the scope of pottery, for example her bronze-like surface which convey a dramatic sense of history and the passage of time.